According to Metservice.com many areas in NZ “was a sopping wet April for much of the country, with rainfall ranging between 200% and 350% of normal over the entire North Island and the north and east of the South Island”. That is a lot of water and often it is only when we have a torrent of rain that drainage issues become apparent. Cempro is proud to be able to supply the best performing Channel & Grate drainage systems available in New Zealand. We have a range of HYVOL Channels & Grates to suit a variety of uses from Domestic Applications such as cars and domestic light vehicles to Commercial Applications including Heavy Transport & Forklift use. Whether you need HYVOL Channels & Grates for a vehicle crossing or if you need to replace a channel or grate even if they are not HYVOL contact us or PHONE NOW 09 832 9088. Recently a couple walked into Cempro enquiring about our EZI-ROC rocks. The purpose of their visit was to find a hollow rock to put the ashes of their loved one inside and place it in their beautiful memorial garden. In fact, this was the third rock they had purchased for this purpose. The type of rocks they chose were our Quarry Rocks and are all different to achieve a natural look in their garden. A special engraved plaque was fixed to each rock. The EZI-ROC rocks are set into an area of their garden and landscaped with their favourite shrubs, trees and flowers. 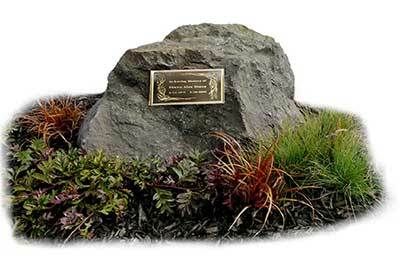 Each EZI-ROC have a memorial plaque that is mounted onto the rock. Should a shift in residency occur they can easily move the rocks and create another outdoor space at their new home. Another addition to a memorial garden could include a Water Feature such as our Adwater Waterfall Rocks. The peaceful sound of gentle flowing water can enhance the outdoor space and is visually appealing. More information can be found on our website or contact us 09 832 9088. Cempro have a fantastic range of other products that add interest to your garden or patio areas that are not water orientated therefore easy to purchase and place. 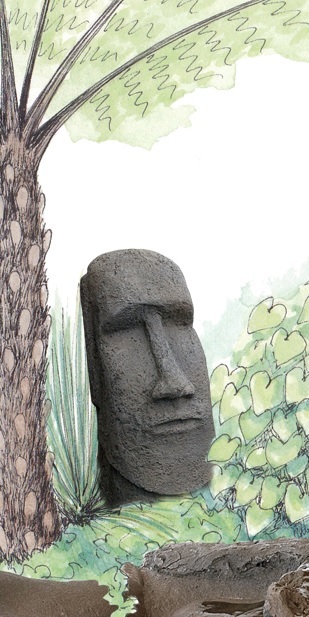 Our Easter Island Moai looks impressive when set in amongst shrubs due to its one metre height. As do the Guardian Statues which also come in three different sizes ranging from 1.2m to 0.6m high. Our Aztec stone seat can be a seat or place a potted plant on top for a different look. 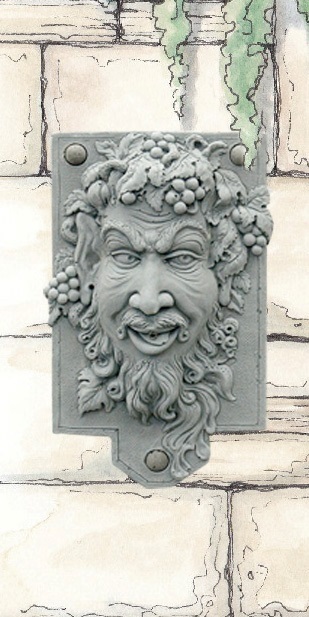 We also have a variety of statuary that can add interest to a boring plain wall such as the Hercules Bust to complement a Greek style patio, or the Bacchus (God of Wine) with a comical expression may add some interest and a talking point. Other visually appealing Gardenware pieces are the Japanese Lanterns especially the larger one; the perfect accessory for your Oriental Garden. More information on Sculptures & Statuary can be found on our website or contact us 09 832 9088. Have you been thinking of creating a beautiful garden sanctuary or develop an area for a tranquil waterfeature? Maybe it is something you have been considering for some time now or you may have been newly inspired. Either way now is the perfect time to initiate such a project which will see it come into fruition before the summer holidays; perfect timing for those BBQs and other social gatherings. Some preparation will be required of course, for example preparing the ground for an adwater pond or chocking for some of our tiered water features such as the Shangi-la falls or Gentle Cascades. Once the water or garden feature is in place you will be able to pave up to or plant out with suitable shrubs and grasses etc. You may like to add some more rocks or pebbles. Possibilities are as endless as the imagination. Sure, it will take effort and you will be rewarded every time you sit and relax in your special space. We know winter is on its way when temperatures drop, the days get shorter and the nights get longer. It may be wise to check for any drainage issues before the inevitable deluge occurs. Undirected water can cause a lot of damage and can be expensive to rectify. Like other drainage systems our HYVOL surface water catchment channels and grates need some maintenance to ensure water flows correctly. Leaves and other debris can prevent maximum surface water from flowing into the channels. If there is no grate security in place, the grates can be removed to allow the channels to be washed out. If there is grate security these can be undone or it may be possible to direct water under pressure from a hose or water-blaster to remove the debris without removing the grates. 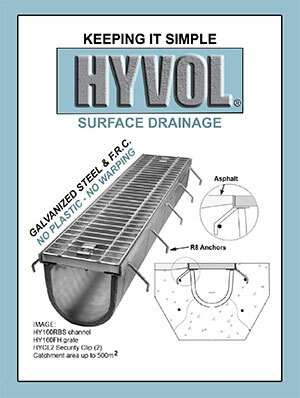 If you have a HYVOL sump remove the grate and check for any build-up of silt inside it. Regular checking of any drainage systems are recommended. If you find a drainage channel or grate needs to be replaced even if they are not our HYVOL drains contact us or phone 09 832 9088.